1. ORS CREAMY ALOE SHAMPOO: I’m one to pick shampoo over conditioner any day, simply because shampoo guarantees that all the dirt is lifted off my scalp. I love this product because it’s very moisturising even though it’s a shampoo. it doesn’t leave my hair stringy or dry. The shampoo is creamy and gives the right amount of lather and moisture after rinse. 2. ORS EDGE CONTROL: I put up a photo of this a while back on Instagram to get people’s thoughts on the product, and I realised a lot of people didn’t like it. Many claim it gets oily or dries off white. Ironically I figured most people do not know how to use this product properly. I discovered that when used in excess it truly dries white. The key is to use a little and apply with a small hair brush. I totally love it. It keeps my edges slick and neat. I’ve used a few other brands, but it’s not just the same. I keep going back to ORS edge control. 3. CANTU SHEA BUTTER LEAVE IN CONDITIONING TREATMENT: This product smells lovely and penetrates deep into the hair strands after washing. It’s great for styling and moisturising hair. I noticed that since I started using it as a leave-in treatment, my hair texture and shine has improved. 4. ORGANICS CARROT OIL CREAM: This is the holy grail of all my products. I use it every single time I style my hair as a bun. I simply spritz my hair with water and brush this product on my hair. After scarfing for a few minutes, my curls instantly pop and my hair appears moisturised, shiny and healthy. I think I’ve gone through 5 cups of this cream. 5. ECO STYLER GEL: Need we say more? Every naturalista knows how awesome this gel is. I’m quite dramatic so I literally say a prayer for the producers of this gel when I use it. it comes in different variants, but I like the Argan oil version. The gel unlike other gels as it doesn’t leave a cast or flakky effect. it keeps your hair slick and manageable. Absolutely great for daily styling and high buns. 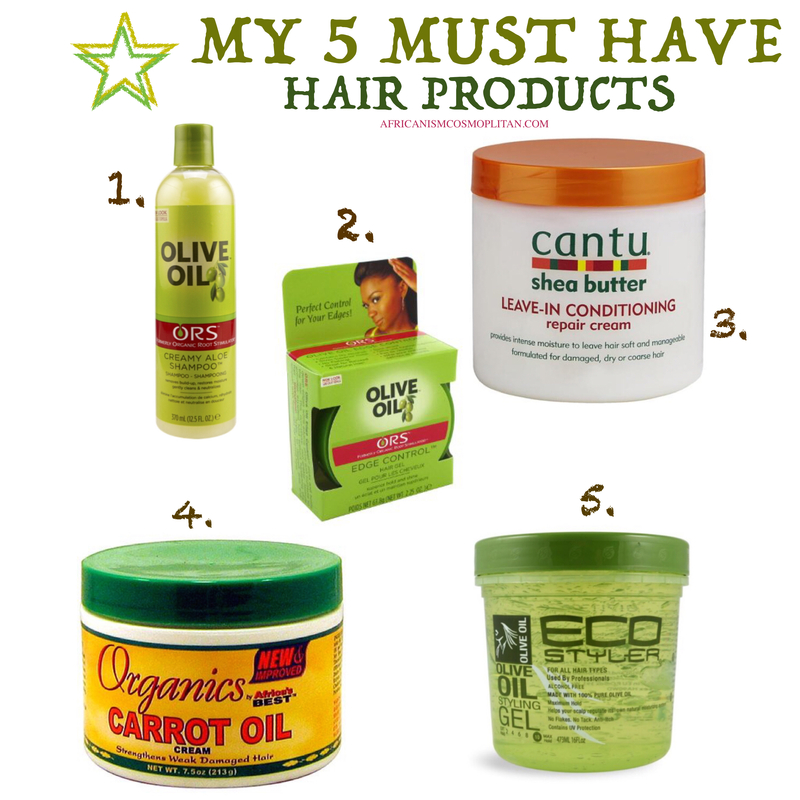 Do let me know your natural hair product faves! Hi Tosin! This is so helpful. I’ve just started to wear my hair out after 2 years of being natural and I’ve noticed some unusual shedding. What products do you recommend for a protein/cholesterol treatment? What products would you recommend for a protein/cholesterol treatment? Hello, thanks for reading. Shedding may be caused by your diet aswell, you may want to look into that. However I experienced this also, but I think it’s just a phase. A great protein treatment is organics cholesterol or Beauty formulas hair deep conditioner. Hi Tosin, I love ur hair. I’ve noticed dat my hair flakes on d 3rd day of putting my hair in a bun with ecostyler, even when d only product in my hair is coconut oil n d gel. Wat could cause d flaking and how can I achieve sleek buns without d flaking. Tnx in anticipation. Yes at cantu repair cream! Lol just that I love the smell, then that carrot oil cream is a just a staple I’ve gone through about 4 tubs lol love it. Hi tosin I really love your posts but my natural hair is still so hard and makes it difficult for me to style and Eco gel doesn’t even make matters better because it doesn’t work for my hair.what do you recommend? Hi Tosin I really love your posts,I have a problem with my natural hair its really hard and makes styling difficult my Eco styler doesn’t even help matters .any recommendations please?